"I strive to provide my clients with the same level of service I would expect myself." Tom joined the C.P.A. firm of Biggs, Hausserman, Thompson, & Dickinson PC (BHT&D) in 1981 after graduating with honors from Grand Valley State University. 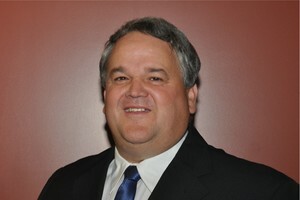 Tom earned a Bachelor's of Business Administration Degree from the Siedman School of Business and was inducted into the Delta Mu Delta National Honor Society for Business Administration. Tom played football while attending Grand Valley and Ferris, and was a member of the Ferris wrestling team. Tom became a C.P.A. in May of 1982 and became a shareholder in BHT&D in 1988. BHT&D has over 20 associates and has been a leading provider of accounting services in the central Michigan area for over 40 years. Tom engages in financial, estate, insurance, and retirement planning in his work through Biggs, Dickinson, & Roberts Wealth Management Services. He has been a Registered Investment Advisor for 13 years and a Certified Financial Planner for five years. Tom maintains licenses to provide insurance and investment advice in a number of states, including Michigan. Tom has long practiced the belief that it is his obligation to give back to his community. He has served on numerous civic and charitable organizations as well as assisting professionally in the establishment of many non-profit organizations. Tom has served as board chariman of Sparrow-Ionia Hospital. He is the financial secretary and treasurer for LeValley United Methodist Church, a charter board member of the Ionia County Community Foundation, and a corporate board member of Mercantile Bank. Tom has also volunteered his time to the City of Ionia, Ionia Public Schools, and the Greater Ionia Youth League. Tom has been married to Tammy (Ferris) since 1983. They have one daughter and two sons. He spends his personal time in a wide variety of activities including reading, woodworking, travel, golfing, and motorcycle riding. Tom also enjoys helping his son compete in dirt track UMP late model and UMP modified racing at various dirt tracks around the Midwest.